"I wanted to thank you for the excellent material. Even though technical information is available from a myriad of sources, your course provides a one on one view of the profession that simply cannot be found elsewhere." -Satisfied student from New York. "I became interested in piano services when I was still in high school, and tried to teach myself the basics from borrowing a book from the public library. After a couple of years of practicing on my own piano, I decided that this was the career that I wanted to pursue. I could not afford to attend regular college, and was not really interested in taking a bunch of courses that had nothing to do with pianos anyway. I also could not afford to attend school specifically for piano technology, so I took the American School of Piano Tuning course, and I graduated in 1982. I took the courses one by one, as I could afford to. This course really changed my life! 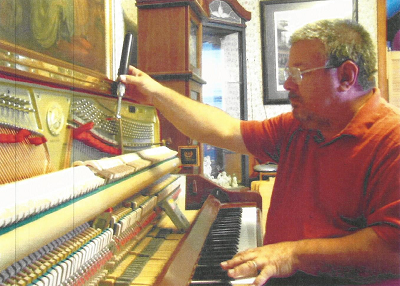 Today, 32 years later, I am one of the most successful piano technicians in my area, and I still look forward to going to work every day. It does take a while to build up a clientele, but in the long run it is worth it. When my kids were little, I could stay home with them during the day, and tune pianos after dinner or on Saturdays. Now, my kids are grown, and I set my own hours, and very rarely ever have to work on a Saturday. Being your own boss is great, you can schedule your own days off whenever you need to, for whatever reason. My advice to anyone thinking about this course is to take it, and get involved with your local PTG chapter. If possible, I aslo recommend that you get connected with any piano dealers in your area, at least until you build up a client base. You will be glad that you did if you stick with it."